So it’s just a two-dimensional equivalent of writing y = cos(kx – ωt) or, more generally, y = F(x−vt). What we do here is converting something that’s expressed in time units into something that’s expressed in distance units, and vice versa, as both dimensions are related through the wave velocity: v = x/t = Δx/Δt. You’ll say: how do you get from F(x−vt) to cos(kx – ωt)? That’s simple: the argument of a sinusoidal function is expressed in radians, rather than in meter or in seconds. So, using the v = λf formula (the velocity of a regular wave is its frequency times its wavelength), we’d write y = cos(2π(x–ct)/λ). We divide x–ct by the wavelength λ here, so the (x–ct)/λ factor is something that’s measured not in meter but in wavelengths, and then we multiply the thing with 2π because we know that one cycle (i.e. one wavelength) corresponds to 2π radians—and we need an argument expressed in radians in our sinusoidal function, because it’s an angle! It has to be. Now, k = 2π/λ and ω = 2πf, and so we substitute and we get what we wanted to get: cos(2π(x–vt)/λ) = cos[(2π/λ)x–(2πv/λ)t) = cos[kx–(2πf)t) = cos(kx – ωt). I managed to explain this to my 16-year old son, Vincent, so you should have no difficulty in understanding this. So ψ = ei(kx − ωt) is the same old wavefunction, really. The only thing is that this ei(kx − ωt) function gives you two functions for the price of one. 🙂 To be precise, a sine and a cosine function are one and the same function, really, but with a phase difference of 90 degrees, so that’s π/2 radians. That’s illustrated below: cosθ = sin(θ+π/2). What does this say, really? This formula tells us that our ψ(x, t) = e−i(ωt − kx) wavefunction is two-dimensional indeed. Now, the term ‘dimension’ is one of those ubiquitous terms in physics and in mathematics that means different things in different contexts, so I should be more precise here but… Well… I can’t. The wavefunction consists of two parts. 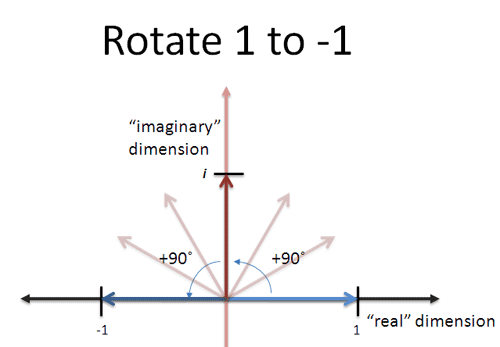 One part is referred to as ‘real’ (I am talking about the cosine here) while the other (the sine) is referred to as ‘imaginary’. However, both are equally real, of course, because… Well… Both are equally essential: the one bit comes with the other, and vice versa. Multiplying some vector quantity with the imaginary unit (i) amounts to a (counter-clockwise) rotation by 90 degrees. When you see a Laplacian in physics – as we do in Schrödinger’s equation (∇2 = ∇·∇ = ∂2/∂x2 + ∂2/∂y2 + ∂2/∂z2) − it will usually represent the flux density of the (gradient) flow of a function. The heat flow is represented by the h vector, and its magnitude is the thermal energy that passes, per unit time and per unit area, through an infinitesimally small isothermal surface, so we write: h = |h| = ΔJ/ΔA. The magnitude of h is proportional to the magnitude of the gradient ∇T, with the constant of proportionality equal to κ (kappa), which is called the thermal conductivity: |h| = h = κ|∇T|. Now we can really start talking about what I wrote above: if you see a Laplacian in physics – as we do in Schrödinger’s equation − it will usually represent the flux density of the (gradient) flow of a function. That’s because the physical significance of the divergence is related to the so-called flux of a vector field: it measures the magnitude of a field’s source or sink at a given point. Continuing our example with temperature, consider, for example, air as it is heated or cooled. The relevant vector field will now be the velocity of the moving air at a point. If air is heated in a particular region, it will expand in all directions such that the velocity field points outward from that region. Therefore the divergence of the velocity field in that region would have a positive value, as the region is a source. If the air cools and contracts, the divergence has a negative value, as the region is a sink. Of course, in a block of metal, there’s nothing that moves, except for the heat flow itself, as illustrated below. Both equations model a flow, and involve a flux density of something. Let’s do a dimensional analysis here. On the left-hand side, we have a quantity (∂ψ/∂ψ) that’s expressed per second, while on the right-hand side, we have ∇2ψ = ∇·∇ψ, which is expressed per square meter, so it is a flux density alright! Now, in our heat diffusion equation, the dimensions came out alright because of the dimension of the diffusion constant, i.e. D = κ/cv. The specific heat (cv) is expressed in J/(m3·K), while the thermal conductivity, κ, is expressed in W/(m·K) = J/(m·s·K). Dividing the latter by the former gives us a diffusion constant with dimension m2/s, so it works out: we get something expressed per second on both sides of the equation. The diffusion constant in Schrödinger’s equation is iħ/2m, whose dimension is [J·s]/[J/(m2/s2] = m2/s, so that works out too! We get something expressed per second on both sides of our equation… Except… Well… We conveniently forgot about i! Is that part of the ‘dimension’ of the right-hand side? I’d say: it is and it isn’t. Remember that the wavefunction (and, hence, Schrödinger’s equation) gives us two functions for the price of one: we’ve got a real part, and we’ve an imaginary part. Now, multiplying both by i amounts to a rotation by 90 degrees, so what’s happening here is that the real part of ∇2ψ becomes the imaginary part of dψ/dt, and the imaginary part of ∇2ψ becomes the real part of dψ/dt. Well… And there’s also this scaling factor ħ/2m, of course. This is very deep. First the minus sign. Does that reflect the clock- or counter-clockwise direction of rotation of the θ argument in the wavefunction matter? No. Time goes in one direction only and, in quantum math, that’s reflected in the argument going clockwise with time. If we’d replace i by j = −i, we’d have a complex-number system that works exactly the same (j2 = (−i)2 = i2 = −1). We would just write dψ/dt as dψ/dt = a + jb, and ∇2ψ as ∇2ψ = c + jd, but so we’d still find that a + jb = (jħ/2m)·(c + jd) = (ħ/2m)·(–d + j·c), so we’d write the same: Re(dψ/dt) = −(ħ/2m)·Im(∇2ψ) and Im(dψ/dt) = (ħ/2m)·Re(∇2ψ). What these bizarre equations above actually mean is not immediately clear. We had an equation that established a relation between (1) a quantity changing in time (i.e. a quantity expressed per second) and (2) its flux density in space (i.e. a quantity expressed per square meter). To be precise, on the left-hand side of Schrödinger’s equation we had the time rate of change of an amplitude, while on the right-hand side we have its flux density. […] Well… We should be precise here: that Laplacian gives us the flux density of the gradient flow of ψ. But… Well… What? As you know, Minkowski used these words as an introduction to his theory on four-dimensional space-time, which was nothing but a mathematical formalization and generalization of Einstein’s special relativity theory of relativity. So these words have nothing to do with quantum physics, although Planck had already introduced the fundamental quantum-mechanical postulate (quantization of energy) a decade before. Nevertheless, the Re(dψ/dt) = −(ħ/2m)·Im(∇2ψ) and Im(dψ/dt) = (ħ/2m)·Re(∇2ψ) equations do lead us to thinking that the time rate of change of the wavefunction and the flux density of its gradient flow are both the manifestation of a deeper, underlying, reality. In the case of the heat diffusion equation, that underlying reality is the flow of (heat) energy. 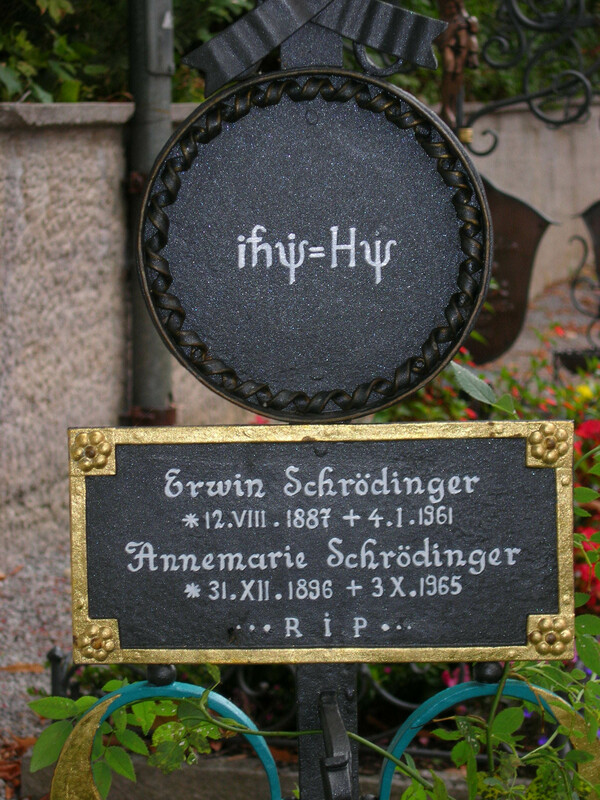 Now, as our wavefunction describes some particle moving through spacetime, and remembering Einstein’s mass-energy equivalence relation, it’s obvious we should be able to find a similar interpretation for Schrödinger’s equation. That brings me to the second point, which I mentioned in other posts too: there is that striking mathematical similarity between (a) the real and imaginary part of the traveling amplitude, and (b) the E and B vectors that characterize the traveling electromagnetic field. Look at the two illustration below. The first one visualizes the real and imaginary part of the ψ(x) = eikx function (so that’s the ψ(x, t) = e−i(ωt − kx) at t = 0, or at some other fixed point in time). So we’re missing the time dimension here. The second illustration shows how the electric field vector E varies in space as well as in time, but it does not show the magnetic field vector B. But so we don’t have B. How would B look like? The animation above shows the electric field vector (E) for a so-called circularly polarized electromagnetic wave. You know the magnetic field vector B is always orthogonal to E, as shown below, with a magnitude that’s equal |B| = B = |E|/c = E/c. 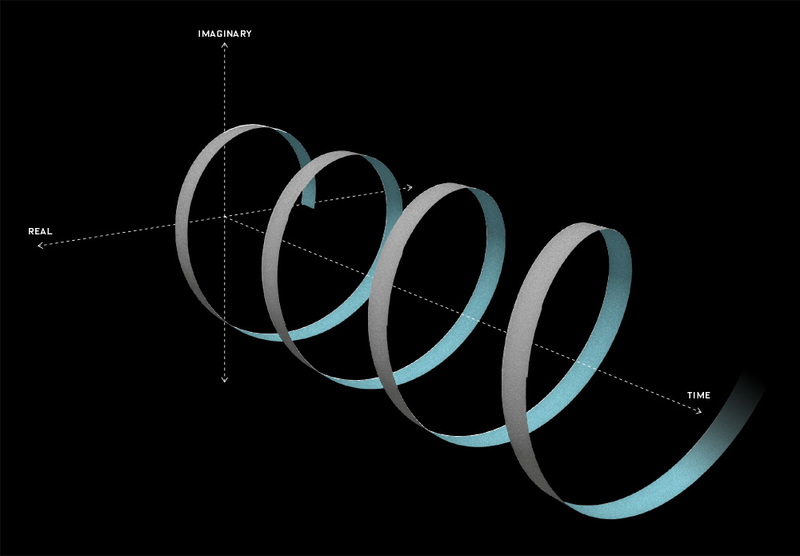 The animation below shows how a linearly polarized electromagnetic wave (i.e. a plane wave, really) is supposed to travel through space: the red oscillation is the electric field vector, and the blue oscillation is the magnetic field vector (never mind the 1/c factor here). So now it’s OK!? The only logical conclusion is that we must be doing something wrong when multiplying the two de Broglie equations. To be precise: our v = f·λ equation is probably wrong. Why? Not sure. It’s just something one shouldn’t apply to our complex-valued wavefunction. The ‘correct’ velocity formula for the complex-valued wavefunction should have that 1/2 factor, so we’d write 2·f·λ = v to make things come out alright. But where would this formula come from? The period of cosθ + isinθ is the period of the sine and cosine function: cos(θ+2π) + isin(θ+2π) = cosθ + isinθ, so T = 2π and f = 1/T = 1/2π do not change.